The Esetta Modular system is a simple, elegant way of creating framework structures for a variety of uses such as promotional displays, exhibition stands and retail interior displays. Vertro is the collection of modular aluminium systems we use to create contemporary exhibition stands. These stock profiles enable us to design and build strong portable displays that can be reconfigured in different shapes and sizes for various events and venues. WHAT IS ESETTA DESIGNED FOR? Esetta is designed to be reconfigured for larger or smaller events, using stock components to keep costs realistic. Stock components are used to create exciting, practical designs whilst providing cost-effective solutions. Custom features add the wow factor! 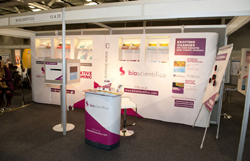 To help defray the cost of an exhibition, we offer a hire option, lease facilities or purchase package. WHAT IS VERTRO DESIGNED FOR? The stands are designed for optimum portability, so that clients can ship and assemble themselves, if they choose, rather than using POD Exhibitions’ complete installation service. For larger designs we offer a complete turn-key solution, including shipping, installation and storage between events. The aluminium profiles provide light yet extremely strong structures, on which a variety of graphic materials can be employed to create stunning visual displays. We pride ourselves on our acclaimed use of Tensioned Fabric Graphics, the latest printing technology, which provides bright, powerful images which may be back-lit, whilst remaining the most cost-effective graphic medium available. Feature panels such as lockable doors, slat-wall and back-lit acrylic can all be included in these extremely versatile designs. 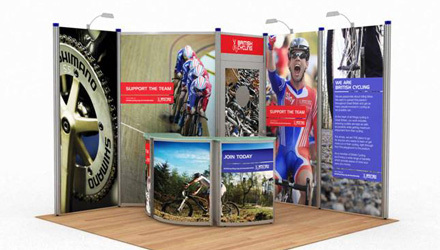 Pop-Up Stands are the industry standard display unit, largely due to the simple method of erection and the ease with which the whole unit can be stored and transported within a transit case that converts to a podium. However, Pod Exhibitions has extended the possibilities of the humble pop-up to create a range that includes features such as Illuminated showcase windows, Audio-visual screens mounted to the stand, shelves and literature holders. 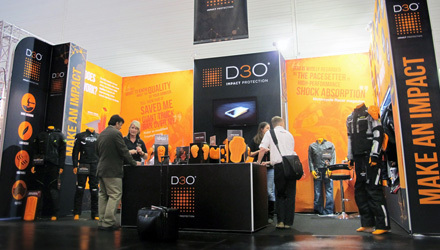 The d400 Pop-Up Stand has a unique aluminium end-plate, rather than the graphic D-end, which allows the curved and straight units to be physically linked together. This plate also enables the user to add shelves and literature holders at will. 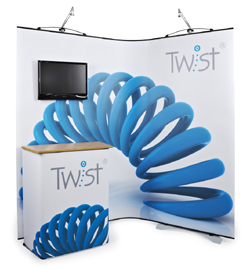 Our Multimedia Pop-Up Bundle is a very popular way of adding a digital screen (up to 22”) directly to the face of the stand. This means the screen is incorporated into the graphic design elements of the Pop-Up Stand. As marketing budgets are reduced, exhibitors seek ways to get a return on the investment they make on smaller, or odd-sized stand spaces. A noticeable trend is that event organizers are reducing the floor space areas in order to make the events look fuller, as bookings drop. 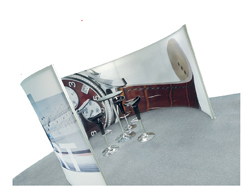 Linking banner systems offer a great solution as they have a smaller footprint and hence take up less floor space. Because they are flexible in the way they link together, they are ideal for creating a graphic wall around a shell scheme or small corner plot. A key system in these flexible modular kits are The Twist range, the affordable Curve and the brand new Link connecting banner system. POD Exhibitions have been appointed as one of only 20 distributors of the exciting new Link system. It is the world’s first roller banner that interconnects seamlessly, with no gaps, and also has an integrated light box in the base to illuminate your branding. Our off-the-shelf Tension Fabric Systems offer a very cost effective method to create large graphic walls, arches and privacy booths. We use them to line the walls of shell schemes, create freestanding exhibitions stands and on interior design projects. As more clients opt for shell schemes, a simple method to line the walls with a simple-to-erect graphic wall, that can pack away into a shoulder bag is required. 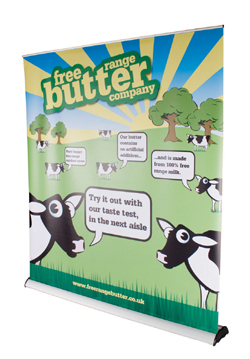 Our range of extra-wide banner stands provide just such a solution. These Banner Backdrops are ideal to create a graphic wall within a foyer or conference centre. With banner sizes up to 2 metres wide and 3 metres high, nothing could be simpler to ship or erect.